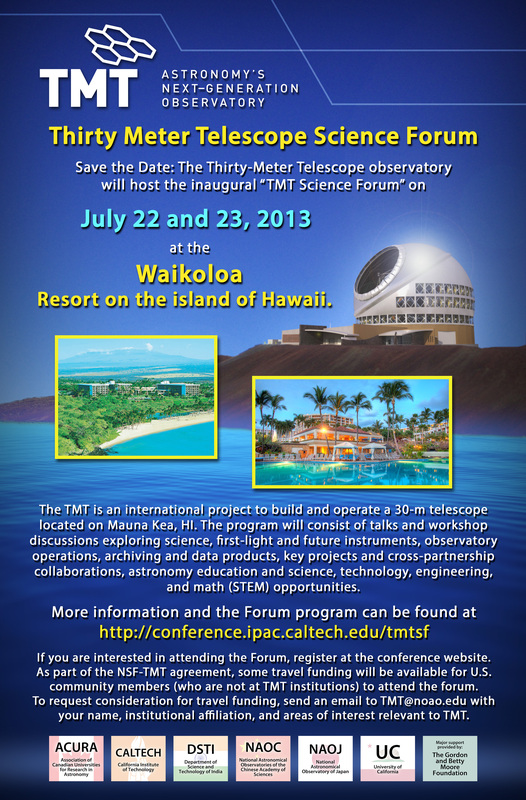 The Thirty Meter Telescope (TMT) is hosting the first Science Forum in Waikoloa, Hawaii on July 22 and 23 2013. The TMT is an international project to build and operate a 30-m wide-field, alt-az Ritchey-Chretien 492 segment telescope on Mauna Kea, Hawaii, with a planned first light in 2022. International partners include Canada, China, Japan, and India. A total 150 people are registered for the Forum, which will be held annually. Per a new Cooperative Agreement between the TMT and the U.S. National Science Foundation (NSF), the forum aims to to engage the broad US astronomical community developing a model for partnership in the Observatory science and operations, including the development of international collaborations. Topics for discussion include “science, first-light and future instruments, observatory operations, archiving and data products, key projects and cross-partnership collaborations, and astronomy education and science, technology, engineering, and math (STEM) opportunities.” I understand that the meeting will post links to talks, which focus on science use cases, and the posters, which focus on instrumentation and operations; some links have been posted already. There will be no formal proceedings from the meeting, but the plan is to update the science case document. I will write more about individual topics as the meeting progresses. This entry was posted in Astronomy, cosmology, data archives, Data Management, exoplanets, galaxies, galaxy formation, information sharing, Observatories, Operations, software engineering, software maintenance, software sustainability, TMT and tagged astroinformatics, astronomy, data archives, galaxies, galaxy formation, information sharing, Observatories, Operations, scientific computing, software maintenance, software sustainability, time domain astronomy, TMT, transiting exoplanets, user communities. Bookmark the permalink. Bruce, this forum is certainly timely. Looking forward, it would have updates regarding future meetings for this forum. Thanks! Hi from the forum! (currently watching T. Nagao’s talk).